If you now look at the parts of the brain where exceptional things are developing, you will see that these are completely different parts than those after birth. That in itself demonstrates how much baby has already developed in their first half year of life. The parts of the brain that play a role in cognition and learning, language, and social emotional perception are highly active at this time. That does not mean, however, that the other parts of the brain are not active. The brain is always active. If you study the leaps that your baby is going through during this period (relationships, categories and succession), you will see that they are all related to the parts of the brain that are undergoing the greatest development at this time. Acquiring knowledge, really ‘learning’, implies a degree of consciousness. You are actually learning something and not simply responding through reflex actions. You will notice that you baby is already starting to contemplate things. Cognitive learning starts developing now and it will continue to do so through the childhood years. Actually, throughout life, but of course you see that children learn comparatively more than adults do. That is why this part of the brain in a child is extremely active. Your baby has so much to learn in this world. And you learn by experiencing things time and time again. That explains why babies (and children) often repeat things multiple times. The saying ‘repetition is the mother of all learning’ is therefore not just hollow words. By repeating something we understand that what happened the first time was not a coincidence but a law of nature. Therefore, doing something again and again and then repeating it again is excellent for cognitive development. 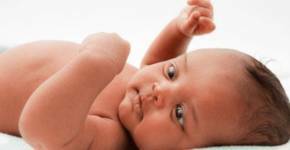 You will therefore not be surprised that your baby is doing that now in this period in which the part of the brain that registers this learning process is extremely active. When your baby was born they could not move consciously. You could say their body moved ‘by accident’. Or in other words, your baby was not thinking about it. 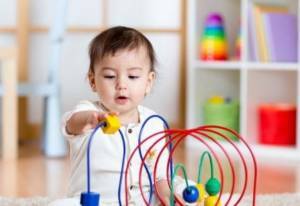 Now your baby is doing that you will notice a change in their gross motor skills. These have developed so much in the past months that your baby can now sit (on average 6 ½ months), crawl (on average 9-10 months) and is busy taking their first steps (first unaided steps on average at 12-14 months). What is interesting about the gross motor skills is that they develop in the order of head to toe! First it is the turn of the muscles in the head and neck, then the arms and the torso, and then, between 6-12 months, the torso and the leg muscles that are required for crawling and walking. The quality of the learning process to master the gross motor skills is influenced by the presence of myelin in the brain, among other things. The more myelin there is, the quicker and better information comes through and can be transmitted from the brain. Myelin develops naturally, but babies who are breastfed produce myelin faster than those who are bottle-fed. 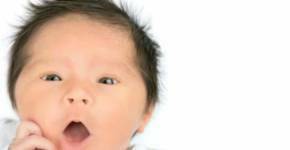 That possibly explains why breastfed babies’ physical development is faster and better than bottle-fed babies. … that a baby’s skull is made to cope with multiple falls during the first year and a half of life? The skull is slightly flexible because the skull plates have not yet completely fused together. This provides the brain with better protection. Talking to your baby is and remains important. At this time, you will notice that your baby can reply with their first words! The more you talk to your baby and stimulate them, the better they will learn. Here you can read about exactly what you can expect from your baby in relation to language and about what you can do to help with language development. In the period of 6-12 months you will also notice increased activity in the part of the brain that is occupied with social and emotional issues. Social interaction is the best way for a baby to learn. The interaction between people, and in particular the people around your baby every day, is essential for development and it contributes to a sense of self-confidence and even happiness. The better the interaction is, the more your baby learns, the faster they will be able to do something successfully, and the happier they will become. So that’s quite something. You will also notice that your baby now responds more to interaction and even initiates interaction. During this period, a section of this part of the brain develops extremely quickly; there is a growth spurt in the frontal lobe. This is responsible for forming bonds between people. The bond you have already built up with your baby is now deeper than before but, on the other hand, this means that your baby now understands that other people are ‘strangers’. That is why after taking the leap (of relations) at six months, and even more so after the leap (of categories) at 8 ½ months, many babies start developing a fear of ‘strangers’. The ‘skittish’ phase rears its head. Here, you can read more about that skittishness and how you can help your baby with it.